Féile U14 Football : Oola V Pallasgreen in Doon @ 4PM on Sunday 26th Feb.
Ladies Minor league: Match postponed. Oola GAA and Oola National School walk/fun run will take place Sunday 19th March at 11:30 staring in Oola Community Centre. Money raised will be used to ehancethe facilities in the scholl and the GAA club for the betterment and enjoyment of the childern in particular the nursery programme. Oola Weekly Lotto 20 February 2016. Jackpot €8,800. No Winner. Numbers drawn 12,19,22,25. Next weeks draw will take place in Neilly's Bar. If anybody would like to recieve texts regarding match fixtures and results along with club info. please send your name and number to Club Secretary Sinead Burns on 0876733821. Unfortunately all numbers were lost due to phone upgrade. GAAyouth Forum 2017 - Saturday 28th October - Apply Now! 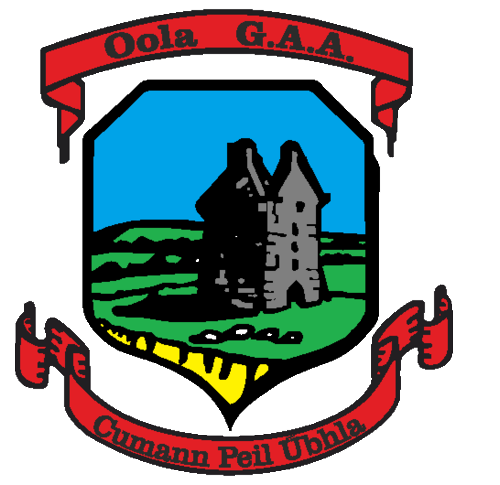 Oola GAA Club is situated in the Village of Oola in County Limerick. We are a Gaelic Football club who field mens and ladies teams at underage and adult levels. Our members play hurling with our neighbouring club, Doon GAA, with whom we are twinned.